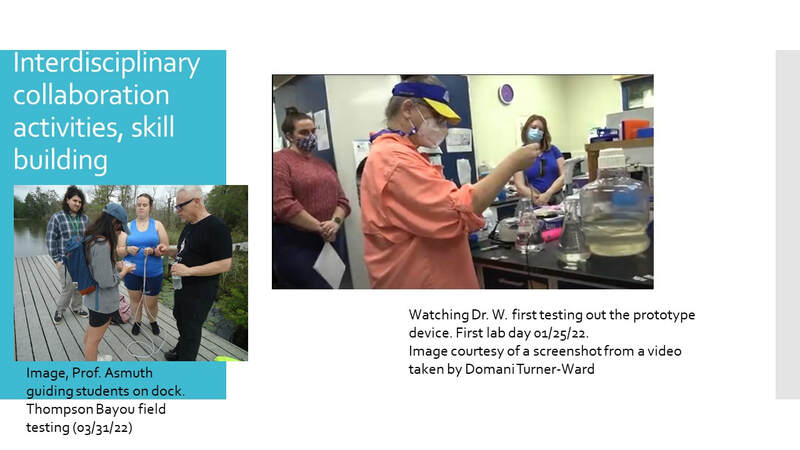 The STEAM 2017 project, “STEAMing the River to the Gulf: Water Quality Assessments and Communication” will combine the efforts of Mr. Thomas Asmuth, Dr. Alexis Janosik, and Dr. Lisa Waidner to tie ecological science studies (STEM) with Art, to address hydrological questions regarding land runoff, nutrient loads, and subsequent water quality. The data will be obtained using two approaches: qualitative and quantitative, for the purposes of K-12 education, undergraduate research education and public outreach, while simultaneously generating products such as art installations, peer-reviewed journal publications, and educational journal publications. The collaborative work will sample local inland waters and the coastal Gulf of Mexico (GoM). Water quality will be documented in digital imaging, examined for bacteria involved in nutrient cycling, and studied for the presence of invasive fish. We will examine water quality beyond turbidity and nutrient loads, using sophisticated molecular biology techniques to assess the presence of animals and microbes directly impacting water quality and fisheries. Preliminary Work. Asmuth’s project “Turbidity Paintings" collected images and water quality data, transforming it into art installations. The work resulted in new methods for constructing inexpensive art-science research tools, such as a photometry sensor and a prototype design for an inexpensive, open source sensor array. This work resulted in a positive economic development impact and increased public engagement through collaborations with artists and scientists of other universities, and the UWF STEAM2017 Exhibition and Colloquium, a program with national participation examining art-science hybrids. The Autumn 2016 pilot project and collaboration among Thomas Asmuth, Matthew Schwartz, and Lisa Waidner, quantitatively assessed water quality and created a database of images to visually demonstrate water quality. In the 3-month effort, we sampled the Pensacola Bay system and coastal GoM, while training undergraduate researchers in the methodology. The purpose of the “Turbidity Paintings” pilot project completed in Autumn 2016 was to merge the images into a concurrent state of data and aesthetic objects. Our plan in 2017 is to proceed with a collection of water samples and images therein, from a wide variety of bodies of water, which vary in nutrient and particle loads, salinity, among many other hydrological parameters. Design Thinking on Experimental Processes and Fostering Interdisciplinary Innovations. The pilot project explored new pathways to a synthesis of art and science. The first application of artistic and design thinking will provide a basis for rigorous, novel interdisciplinary methodologies. Iterative design and critical thought were applied to science methodologies to compare and contrast artistic and scientific processes. As a record of data was made, strong correlations to a 20th century art style called ‘procedural art’emerged. 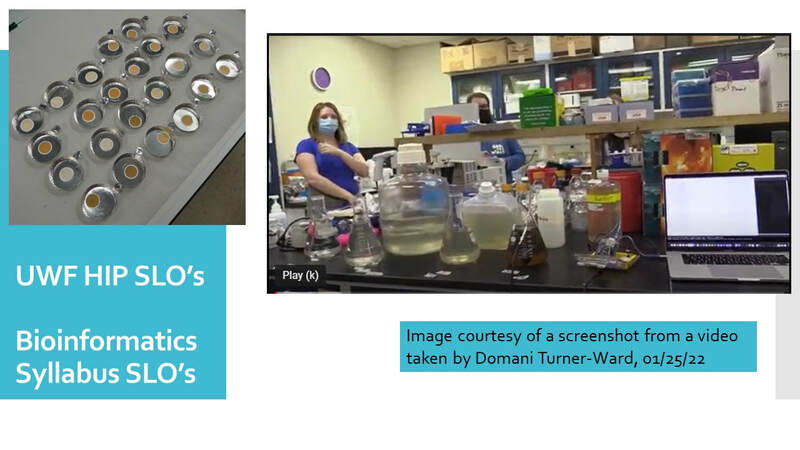 Using a tool called “quantitative PCR” (also known as qPCR), Waidner enumerated a group of bacteria known to be more abundant in turbid waterways. These bacteria, the Aerobic Anoxygenic Phototrophic (AAP) bacteria, are found in freshwater, estuaries, coastal, and open oceans world-wide. The qPCR method used for the preliminary STEAM work is a common molecular biology tool that takes advantage of increasing fluorescence in the presence of rising gene copies. Total aquatic bacteria are also enumerated using epifluorescence microscopy. In this technique, the seawater is preserved (or ‘fixed’) until return to the lab. The water is later filtered onto very thin plastic filters that are dyed black or grey to reduce background. Finally, on the filter, all living organisms that contain DNA are stained with a fluorescent dye (DAPI, 4',6-diamidino-2-phenylindole), and the filter is mounted onto a microscope slide. We can view the slide under the microscope to count all bacteria in the original seawater, river water, or estuary water sample. ​The second focus of the preliminary STEAM work was a feasibility study using inexpensive open source electronics platforms and prior research from open source/bio-hacking communities6–11. A host of inexpensive research tools were employed including an open source remote operated submersible, consumer sports cameras, and rapid prototyping materials found at building supply stores to construct inexpensive art-science research tools, including a photometry sensor for turbidity. Experimental trials have yielded expertise to continue development to automate processes and validate data. AAP Bacteria as a Tracer for Nutrient and Particle Loads. AAP bacteria are cosmopolitan, with a global distribution, and more important to nutrient and organic matter turnover than abundances would suggest12,13. Therefore, AAP bacteria are particularly relevant to food webs in rivers and estuaries where organic matter is driven by land runoff, from natural sources such as humics, forests and suburban trees, and resultant from fertilizer use13. 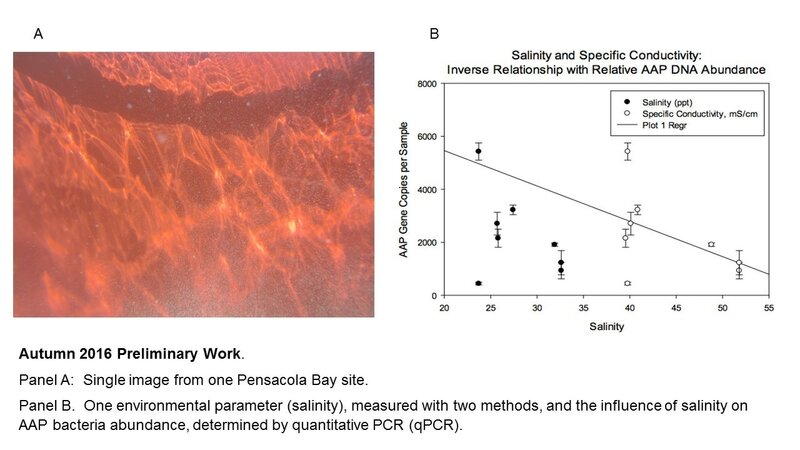 Eutrophic areas, such as those used for aquaculture, are documented to be heavily populated by AAP bacteria5;; and preliminary data suggest that the AAP bacteria in the Pensacola Bay system are essential parts of the microbial food web, impacting nutrient cycling, and hence, overall health of the marine life. Nutrient loads, turbidity, and humics common in estuaries are correlated with the abundance of AAP bacteria. However, there is a clear distinction among freshwater, estuarine and marine types. We will examine the distribution of these “ecotypes” previously documented14, but not yet measured in estuarine and coastal GoM. Finally, we will work on innovative ways to measure the abundance of this particular group of bacteria while developing new educational tools for understanding and communicating water quality. Our first River-to-Bay-to-Gulf transect will take place in July 2017. In four single-day cruises, we will sample 7 stations throughout the salinity gradient of the Escambia River, Escambia Bay, Pensacola Bay, and coastal Gulf of Mexico. We will also be working closely with Barbara Albrecht, President, Bream Fishermen Association, and Director, Panhandle Watershed Alliance, to combine citizen-science water quality monitoring with our research. Check our STEAM blog for updates from the field expeditions and outreach events!!! 1. Asmuth. 23rd Int. Symp. on Electronic Art, Universidad de Caldas, Manizales, Colombia. 2. Asmuth. SECAC 2016, Roanoke, VA October 19-22, 2016. 3. Asmuth. Water and Eco-Art. AESS 2017 Conference. University of Arizona. 4. Waidner, L. A. & Kirchman, D. L. Environ. Microbiol. 7, 1896–1908 (2005). 5. Waidner, L. A. & Kirchman, D. L. Appl. Environ. Microbiol. 73, 3936–3944 (2007). 12. Stegman, M. R., Cottrell, M. T. & Kirchman, D. L. ISME J. 8, 2339–2348 (2014). 13. Koblížek, M. FEMS Microbiol. Rev. 39, 854–870 (2015). 14. Waidner, L. A. & Kirchman, D. L. Appl. Environ. Microbiol. 74, 4012–4021 (2008). 15. Lew, S., Lew, M. & Koblížek, M. Environ. Sci. Pollut. Res. Int. 23, 13853–13863 (2016). 16. Kimball, M. E., Miller, J. M., Whitfield, P. E. & Hare, J. A. Mar. Ecol. Prog. Ser. 283, 269–278 (2004). 17. Janosik, A. M. & Johnston, C. E. Environ. Biol. Fishes 98, 1889–1893 (2015). 18. Pfleger, M. O., Rider, S. J., Johnston, C. E. & Janosik, A. M. Glob. Ecol. Conserv. 8, 99–107 (2016). 20. Laut, J., Wright, S. N., Nov, O. & Porfiri, M. IEEE Control Syst. 34, 60–64 (2014). 23. Hagy, J. and Murrell, M. Estuarine, Coastal and Shelf Science 74 (2007).